I can think of a dozen combinations to represent the sunshine state, but all of them include orange juice. Kirschwasser is a little bit of a outlier, but a good idea for making a drink taste more tropical. If you have an orange for the garnish, juice the rest for the drink. Trust me. 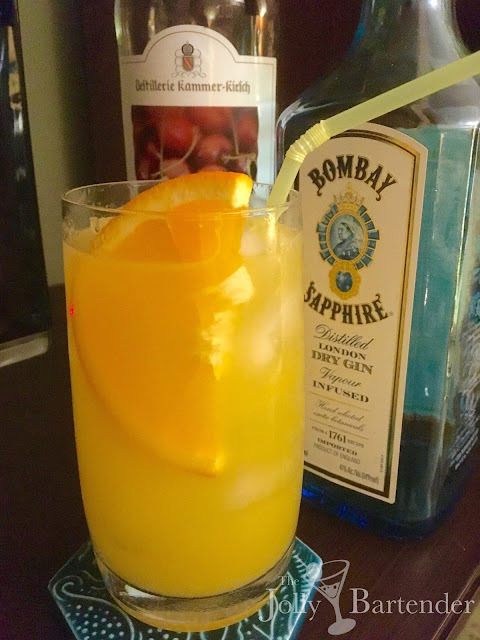 So this is nearly a variation on a Screwdriver--just with gin and kirsch and a bit of other flavors. In that sense, it is a much better drink. Maybe it's not one you will make yourself at home on a bender weekend as you stumble your way around the crap in your horder home (Yes, I'm judging people who only drink screwdrivers incessantly). But I can see this drink as one that a bar might put out there as a refreshing spring drink. Combine all ingredients except orange juice and slice in a shaker with ice. Shake and strain into a Collins glass full of fresh ice. Top with orange juice and garnish with orange slice.